A motorcycle is a vehicle whose motor displaces more than 150 cubic centimeters and has a seat or saddle for the use of the rider. It is designed to travel on not more than three wheels in contact with the ground and weighs less than 1,500 pounds. What is a motor-driven cycle? A motor-driven cycle is a motorcycle whose motor displaces less than 150 cubic centimeters. What is a moped or motorized bicycle? There are two types of motorized bicycles, defined in the California Vehicle Code (VC) Sections 406(a) and 406(b). Section 406(a) VC refers to a moped or motorized bicycle as any two or three wheeled device having fully operative pedals for propulsion by human power, or having no pedals if powered solely by electrical energy, has an automatic transmission, and a motor which produces less than 2 gross brake horsepower and is capable of propelling the device at a maximum speed of not more than 30 miles per hour on level ground. Motorcycles, Motor-Driven Cycles, Motorized Bicycles/Mopeds (Section 406(a) VC ) - A helmet meeting Federal Motor Vehicle Safety Standard 218, self-certified by the manufacturer and displaying a 'DOT' emblem must be worn by all riders of motorcycles, motor-driven cycles, and motorized bicycles/mopeds. Motorized Scooters - A bicycle helmet meeting the standards of either the American Society for Testing and Materials (ASTM) or the United States Consumer Product Safety Commission (CPSC) must be worn to operate a motorized scooter. Motorized Bicycles (Section 406(b) VC) - A bicycle helmet meeting the standards of either the American Society for Testing and Materials (ASTM) or the United States Consumer Product Safety Commission (SPSC) must be worn to operator a motorized bicycle. Effective 1/1/2005, a Class C driver license or driver permit is required. Must obtain an M-1 or M-2 endorsement on a driver's license. 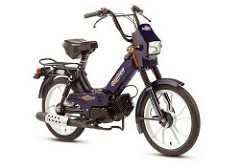 M-2 allows for operation of a moped or motorized bicycle only. Pass riding skills test (DMV will accept certificate of competence from an approved novice motorcyclist training program instead of skills test, such as the California Motorcyclist Safety Program). If the individual is under 21 years of age, mandatory successful completion of a Basic Rider education course approved by the CHP is required, such as the Basic Rider course available through the California Motorcyclist Safety Program. Driver's License not required but rider must be at least 16 years of age. Note: An operator with an instruction permit may not carry passengers, ride after dark or operate a motorcycle on the freeway. Driver must be at least 16 years old. Effective 1/1/2005, a Class C driver's license or driver's permit is required. Effective 1/1/2005, a motorized scooter shall at all times be equipped with a muffler. Effective 1/1/2005, a person shall not modify the exhaust system of a motorized scooter in a manner that will amplify or increase the noise level emitted by the motor. Operation permitted on a bicycle path, trail or bikeway, unless there is a local ordinance prohibiting it. On the roadway with a posted speed limit of greater than 25 mph, driver must operate in Class II bicycle lane. On roads with a posted speed limit of 25 mph or less, riding in a bicycle lane is not required. Operation permitted on private property only. Illegal on highways, sidewalks, bikeways and hiking or recreational trails. Illegal on all roads, sidewalks, bikeways and riding or recreational trails. State Vehicle Code Regarding and Regulating Golf Carts 345. A "golf cart" is a motor vehicle having not less than three wheels in contact with the ground, having an unladen weight less than 1,300 pounds, which is designed to be and is operated at not more than 15 miles per hour and designed to carry golf equipment and not more than two persons, including the driver. 4019. A golf cart operated pursuant to Section 21115 is exempt from registration. 21114.5. Notwithstanding Section 21663 or any other provision of this code, local authorities may, by ordinance, authorize the operation of electric carts by physically disabled persons, by persons 50 years of age or older, or, while in the course of their employment, by employees of the United States Postal Service, state and local governmental agencies, or utility companies, on public sidewalks. Any ordinance shall, however, contain provisions requiring any disabled person or person 50 years of age or older who owns or leases an electric cart to apply to the local authority for a permit and an identification sticker to so operate the cart, and requiring the person to affix the sticker to the cart in order to operate it on the sidewalk. The permit and sticker shall become invalid if the person ceases to operate, own, or lease the cart. This section does not apply to devices described in subdivision (b) of Section 415. 21115. (a) If a local authority finds that a highway under its jurisdiction is located adjacent to, or provides access to, a golf course and between the golf course and the place where golf carts are parked or stored or is within or bounded by a real estate development offering golf facilities and is designed and constructed, so as to safely permit the use of regular vehicular traffic and also the driving of golf carts on the highway, the local authority may, by resolution or ordinance, designate the highway or portion of the highway for combined use and prescribe rules and regulations that shall have the force of law. No highway shall be so designated for a distance of more than one mile from the golf course if the highway is not located within a development or beyond the area of a development, provided, the finding of the local authority in this respect shall be conclusive. Upon the designation becoming effective it shall be lawful to drive golf carts upon the highway in accordance with the prescribed rules and regulations. 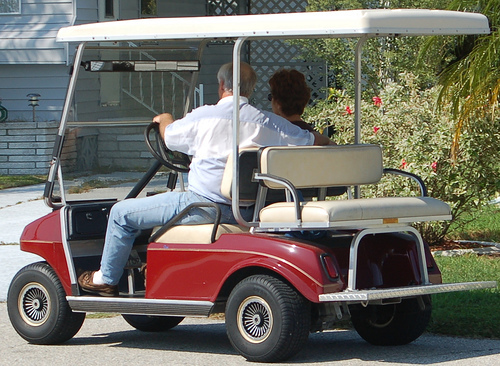 The rules and regulations may establish crossing zones and speed limits and other operating standards but shall not require that the golf carts conform to any requirements of this code with respect to registration, licensing, or equipment, except that if operated during darkness the golf cart shall be subject to the provisions of Section 24001.5 regarding equipment. The rules and regulations shall not be effective until appropriate signs giving notice thereof are posted along the highway affected. A "real estate development offering golf facilities," for purposes of this section, means an area of single-family or multiple-family residences, the owners or occupants of which are eligible for membership in, or the use of, one or more golf courses within the development by virtue of their ownership or occupancy of a residential dwelling unit in the development. 21115. (b) For purposes of this section, a "golf cart" includes a low-speed vehicle. 21716. Except as provided in Section 21115.1 and Chapter 6 (commencing with Section 1950) of Division 2.5 of the Streets and Highways Code, no person shall operate a golf cart on any highway except in a speed zone of 25 miles per hour or less. 24001.5. A golf cart as defined in Section 345 shall only be subject to the provisions of this division which are applicable to a motorcycle. 385.5. (a) A "low-speed vehicle" is a motor vehicle that meets all of the following requirements: (1) Has four wheels. (2) Can attain a speed, in one mile, of more than 20 miles per hour and not more than 25 miles per hour, on a paved level surface. (3) Has a gross vehicle weight rating of less than 3,000 pounds. (b) (1) For the purposes of this section, a "low-speed vehicle" is not a golf cart, except when operated pursuant to Section 21115 or 21115.1. (2) A "low-speed vehicle" is also known as a "neighborhood electric vehicle." 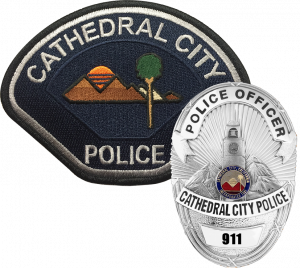 Per Ordinance 620, Municipal Code Chapter 11.52.030 “No Person shall operate any off-highway motor vehicle on private or public lands within the jurisdictional boundaries of the city.” This prohibition precluded the use of golf carts and NEV’s on any street in Cathedral City.